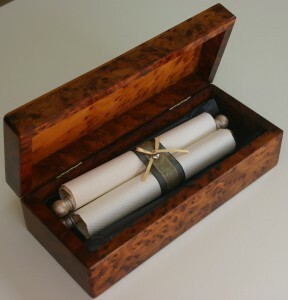 If you want something really special, a luxury scroll from Trinitybox won’t fail to impress. 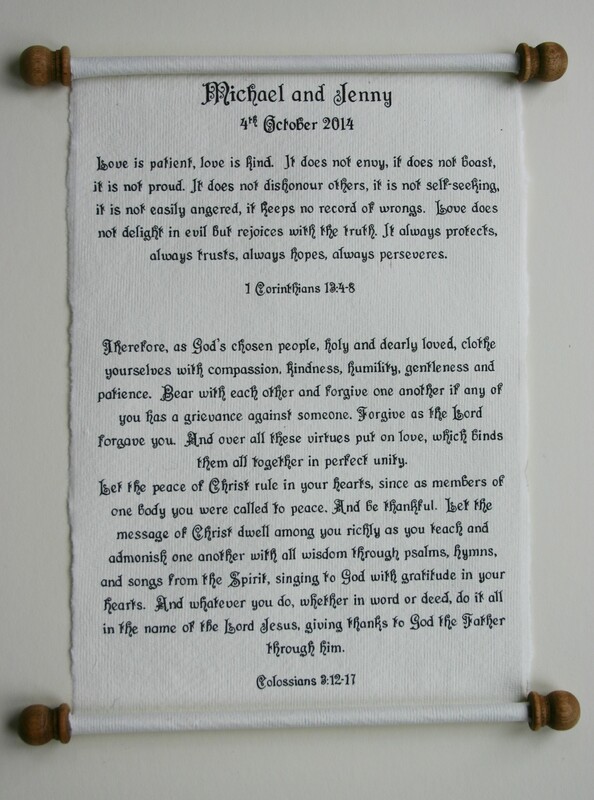 All of these scrolls are handwritten with your choice of calligraphy font . 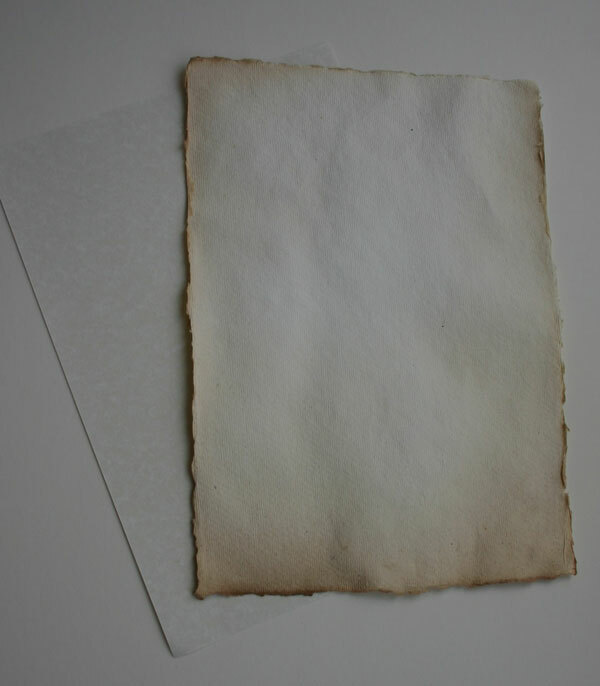 Your chosen message, poem or prayer is handwritten onto either parchment paper or hand made paper with or without the aged effect. 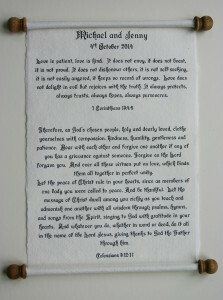 The larger letters and border design will be embellished (very subtly) with a gold or silver paint. You can choose whether or not you would like gold/silver painted, or oak stained dowels and finials as pictured at the top of the page, or none as pictured below. Your scroll will then be trimmed with ribbons and wax seal or charm and presented in an ivory coloured gift box with coordinating ribbons and a hand written gift tag. 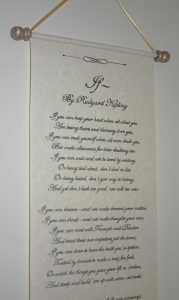 Please click here to see the different calligraphy fonts you can have handwritten on your scroll. 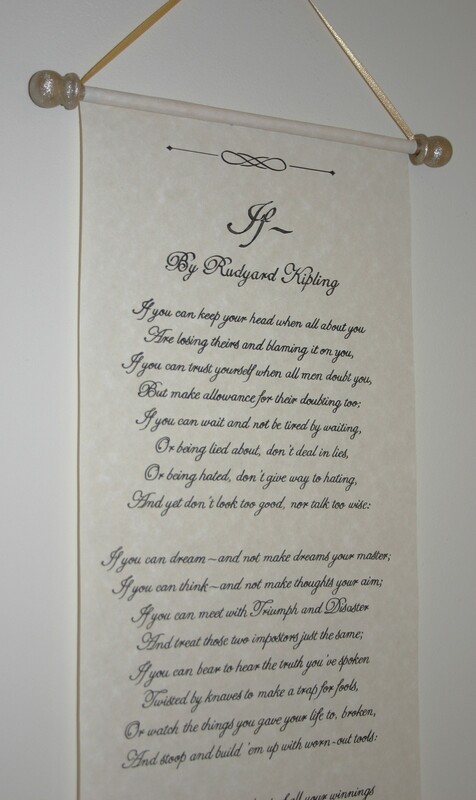 The sample below is using font choice number 1. 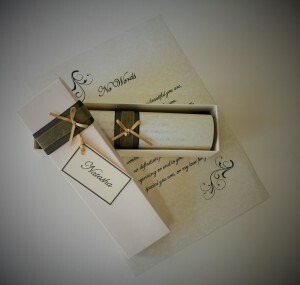 The gift tag is also handwritten in your choice of font. 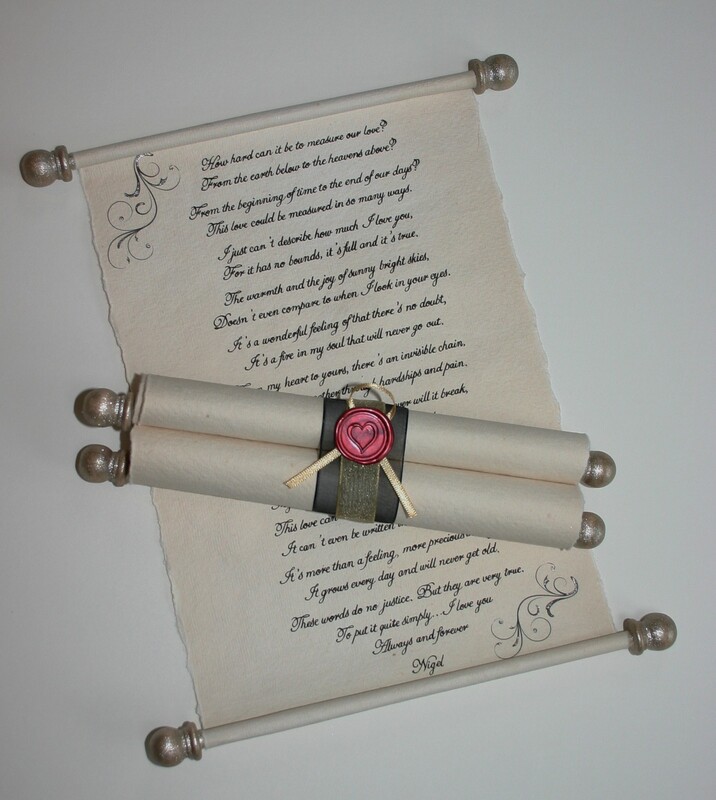 As with the scrolls from the classic range, the choice of charms which are attached to the ribbon that trims the scroll are pictured below, or you may prefer to have a wax seal with a heart or fleur de lis pattern. 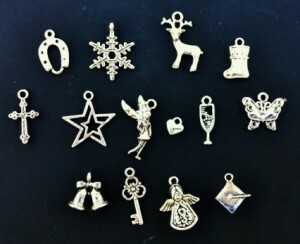 I can also use a gold plated heart charm if you would prefer a gold colour. If you wanted to pull out all the stops, you could have your handwritten scroll beautifully presented in a wooden presentation box pictured below. 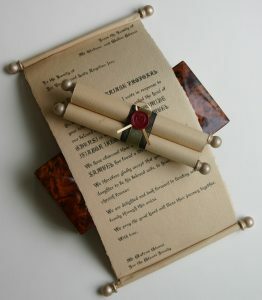 This will ensure that the message on your scroll will be cherished and preserved for years to come in this unique , charming piece of furniture. This box is priced at £45 (box only). I will then get back to you with a quote. 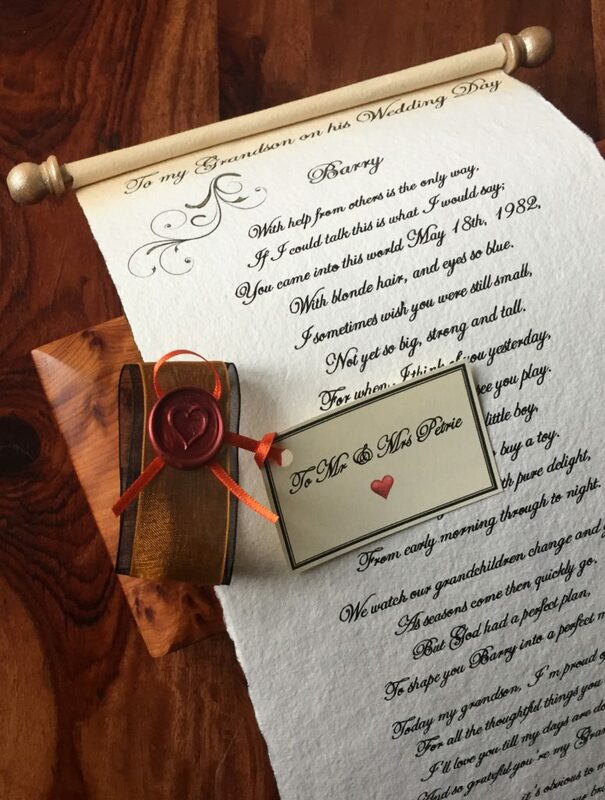 As a rough guide, prices for these scrolls start at £70 to include the handwritten scroll (no dowels/finials) , ribbons & charm, ivory coloured card presentation box with gift tag. This is priced at around 70 words and the price will increase with the word count accordingly. The scroll will take around a week to process, but it may be possible to meet a shorter deadline if necessary. After payment has been received, I will email you a computer mock up of what your scroll will look like, you can then check the font style, layout etc and any amendments can then be made before I hand write your scroll. 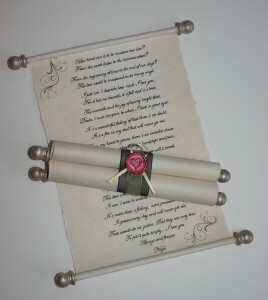 If you have any questions at all about these scrolls, please don’t hesitate to contact me.